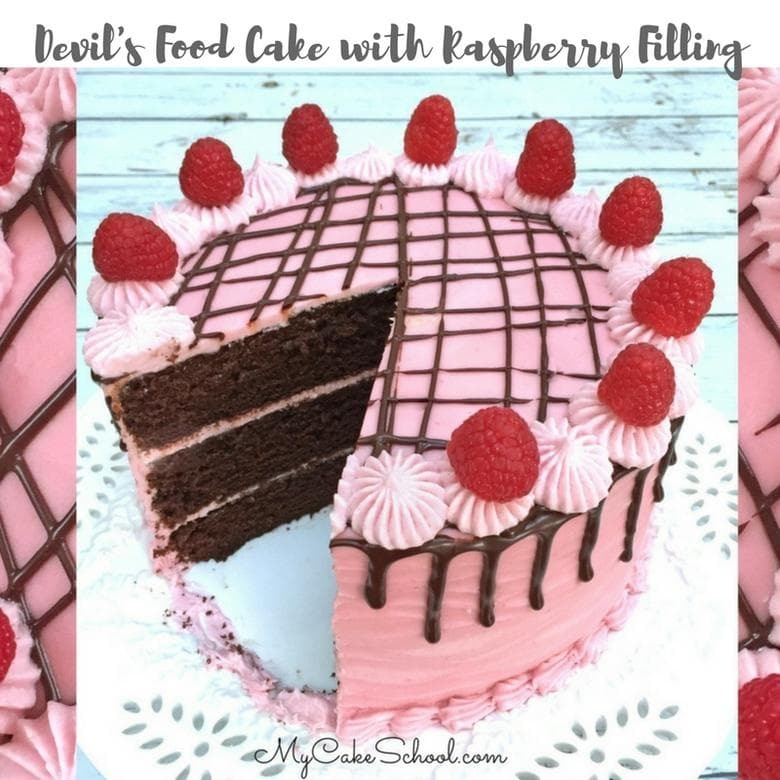 We are so excited to share a brand new scratch Devil’s Food Cake recipe with you, complete with a raspberry and ganache filling and raspberry buttercream frosting. 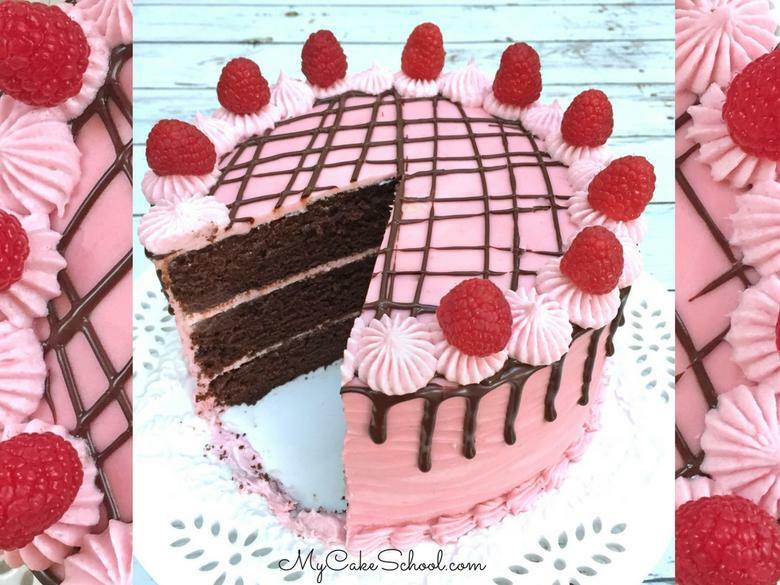 The combination of rich chocolate cake with refreshing raspberry flavor is AMAZING. Much like our scratch Classic Chocolate Cake, this Devil’s Food Cake is ultra moist and brimming with chocolatey goodness. 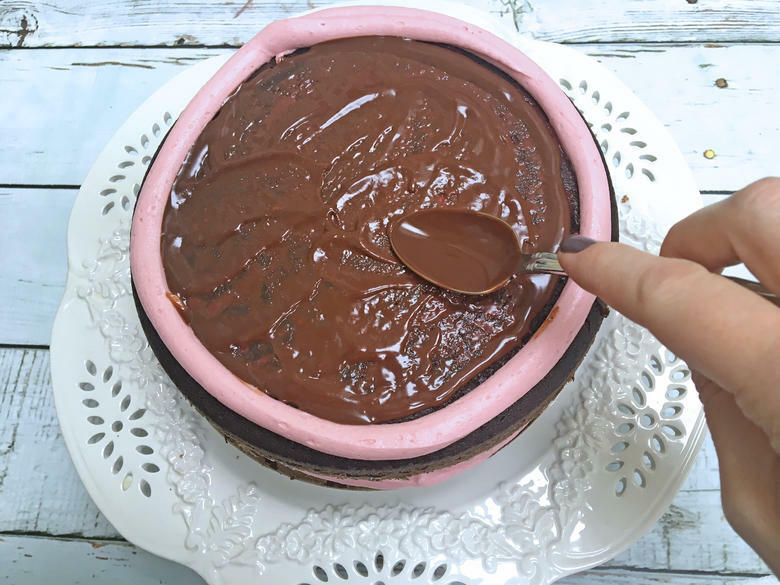 Although our Devil’s Food Cake recipe calls for the traditional mixing method, the resulting cake reminds me of cakes that use the reverse creaming method, as it has a velvety, melt-in-your-mouth quality. This tenderness can likely be attributed to the buttermilk in the recipe, as the acidity of the buttermilk softens the gluten in the flour. We’ve also added melted chocolate to the recipe, in addition to unsweetened cocoa, which lends a decadent flavor and deep color. Raspberry Buttercream is a new recipe for us, and it complements the devil’s food cake perfectly! 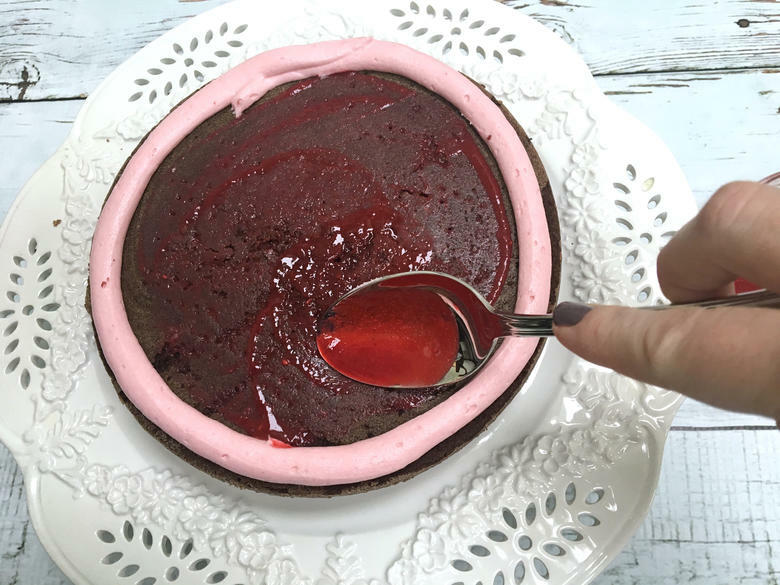 As you’ll notice in the recipe, we used a raspberry puree in our frosting recipe as well as for a simple glaze in between the cake layers. The most time consuming part of the puree is straining out the raspberry seeds. If you are short on time, you can use seedless raspberry preserves instead, although you’ll likely want to add a touch of pink coloring gel. Now for the fun part…assembly! We piped a dam of buttercream on the first layer of cake, followed by a thin glaze of raspberry puree. Repeat the steps for the second layer, and then finish with the top layer and a coat of raspberry buttercream! I used a small angled spatula to add wavy lines in my buttercream as I spun it on a turntable. I piped a shell border around the base with a star tip 21. As a final touch, we added a simple ganache drip, a buttercream border using a french tip 869, and fresh raspberries! 12 oz. bag frozen raspberries, thawed. Seedless Raspberry Preserves can also be used, see NOTE below. Microwave the coarsely chopped chocolate for 30 seconds, let sit for a couple of minutes, stir, then microwave another 20 seconds. It will not be completely melted at this point. Add the chocolate to the hot coffee and whisk the two together until the chocolate is completely melted. In a separate bowl, add the flour, baking soda, baking powder and salt. Whisk for at least 30 seconds to blend. Set aside. Add the softened butter to the mixing bowl and mix until smooth. Gradually add sugar and mix at medium speed 3 to 5 minutes until light and fluffy. Scrape the side and bottom of bowl. Add eggs one at a time, mixing after each egg just until the yellow of the yolk disappears. Scrape the sides and bottom of bowl as needed. Mixing no higher than medium speed alternately add the flour mixture and liquid mixture to the bowl, beginning and ending with the dry ingredients (3 additions of dry and 2 of liquid. Pour into 3 prepared pans. Bake at 350 degrees for 25 to 30 minutes (test at 25 min.). The cakes are done when a toothpick inserted into the center comes out clean or with just a few crumbs attached. Puree approximately 2 cups thawed raspberries in a food processor or blender. Put the pureed raspberries in a mesh strainer to strain out the seeds. Press the raspberries through the strainer with the back of a spoon. It is thick so you will need to scrape the puree off the back of the strainer. You will use this for the buttercream recipe as well as for lightly glazing the cake layers. In a separate bowl, cream the softened butter until smooth. Gradually add the powdered sugar, 1/3 c. + 3 Tablespoons (180g) pureed raspberries, and raspberry extract, beating at medium speed until blended. Continue mixing on medium speed another 3 to 4 minutes (longer if using a hand mixer), scraping the sides and bottom of the bowl occasionally. Slow the mixer down (#2 on a KitchenAid) and mix another minute, this will help to eliminate air pockets. If the buttercream is too thin add more powdered sugar, too thick, add more puree or a bit of milk. Remove and allow to sit for one minute. Gently stir and press chips to aid in melting. If there are still unmelted chips, microwave for 5-10 seconds. Stir and repeat as necessary. Be very careful not to overheat. 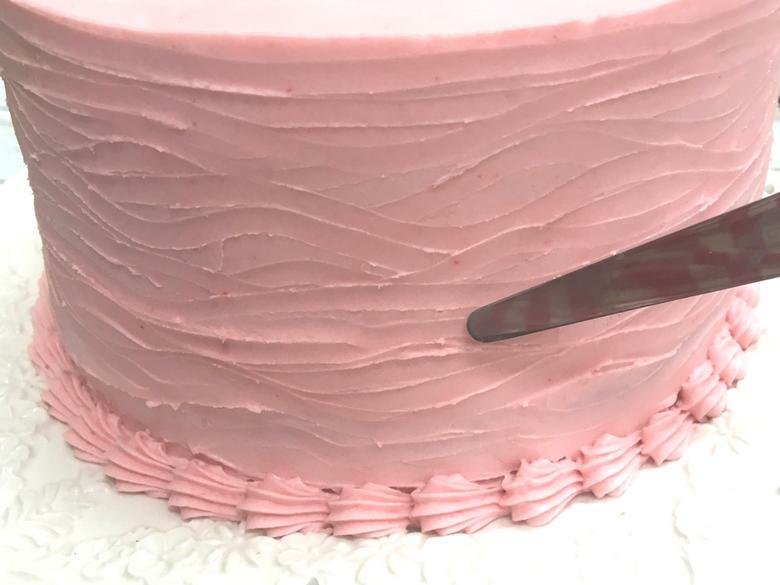 I piped a raspberry buttercream dam around the edge of the first layer of cake (about 1/4 inch from the edge) using a disposable piping bag with the tip snipped away. I glazed the layer with a thin layer of raspberry puree, followed by a thin layer of ganache. Next, I piped on raspberry buttercream and spread it with a spatula. Repeat these steps for the next layer of cake. After frosting the cake, I loaded a disposable piping bag with ganache, snipped away the tip, and created a ganache drip around the top edge of the cake as I rotated it on my turntable. I then piped a quick ganache pattern over the top, and piped raspberry buttercream around the edge of the cake using a french tip 869. I topped every other piped star with raspberries. We hope that you enjoy this recipe! 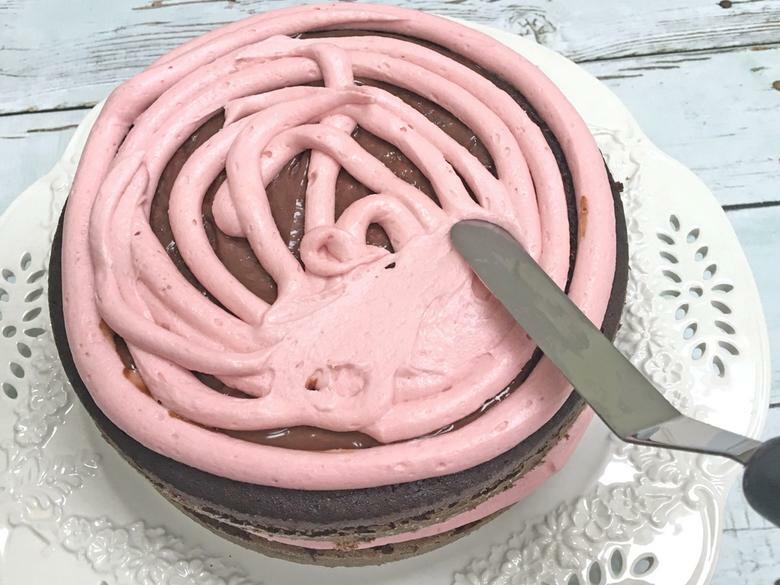 No matter what you pair with this Devil’s Food Cake, you are going to LOVE it, but we highly recommend going the raspberry and chocolate route at least once! My husband who claimed not to be a fan of chocolate and fruit fillings has now declared this his new favorite! He tends to declare most of our cake recipes his new favorite, but if the rate that this cake disappeared is any indication, I’d say it’s a keeper! 12 oz. bag frozen raspberries, thawed. Seedless Raspberry Preserves can also be used, see NOTE below. Puree approximately 2 cups thawed raspberries in a food processor or blender. Put the pureed raspberries in a mesh strainer to strain out the seeds. Press the raspberries through the strainer with the back of a spoon. It is thick so you will need to scrape the puree off the back of the strainer. There will be extra puree that can be spread over cake layers. Gradually add the powdered sugar, pureed raspberries, and raspberry extract, beating at medium speed until blended. Wow! This is an amazing cake recipe and very pretty design. I know it’ll be one of my personal favourites as I love both chocolate and raspberries. Cannot wait to try it! Great job as always. Thank you Corinne, I happy you are going to give it a try. Let us know what you think! I made this yesterday with my 2 granddaughters aged 11 and 9. This cake is absolutely delicious! The cake is moist and the deep chocolate flavor is wonderful. The cake, fillings and frosting blend together beautifully. It is an involved cake to make but my granddaughters had a great time doing the various steps. We are novices at cake making and we were able to follow your direction and get a beautiful end result. I have not been a fan of chocolate and raspberry in the past but this cake won me over. My husband and all my other grandchildren loved it and gave it highest ratings. It is a spectacular cake to look at when finished. I made this cake for a friend. It was excellent. Everyone loved it. Very moist. Hi Suzanne, Your post reminds me of when I used to bake with my granddaughters, lots of fun. They are teenagers now and like to bake when they have time. I’m happy all turned out well and your family enjoyed the cake. Thanks for taking the time to post your thoughts and review of this recipe. Hi Fran, Wonderful!! Thanks so much for giving the recipe a try! I have a question. The recipe calls for 1 cup unsweetened chocolate or 82gr. When I weighed the chocolate 1/2 cup was around 82 grams. I use Hershey’s unsweetened chocolate powder. I used 3/4 cup. What kind of chocolate do you use? And how much should I use? Hi Fran, I use Ghirardelli unsweetened cocoa and I think it should be a similar weight to Hershey’s. Are you using a measuring cup for dry measurements and did you zero out the weight of the measuring cup before adding the cocoa? Your cake should still turn out fine using 3/4 cup cocoa. I have a order due on Sun.. can i bake it on Wed.
Hi Tisha, Yes, you can freeze the cake layers. Wrap individually in plastic wrap and then aluminum foil. If you wrap while the cake layers are still warm it will add to the moisture of the cake. Cake layers can be frozen for 2 months with good results. To thaw, remove from freezer, once condensation forms on the aluminum foil, remove the foil and allow to come to room temperature. Cakes can be frosted with the layers partially frozen unless you are planning to use the Viva Paper Towel smoothing method. Layers need to be at room temperature for that smoothing method. Let me know if you have other questions. In this process can you please let me know what all should I avoid to make the fondant covered cake ? Hi Piyu, if you aren’t going to be refrigerating the fondant cake, I would leave off the raspberry puree. If you are refrigerating, it should be fine! THANK YOU! This recipe is amazing start to finish. A big bonus that the buttercream is what I’m terming “no tears” – that is it is really easy to work with. The Pinterest searches are over – for cake recipes at least. I’ll be turning to your tutorials from now on.